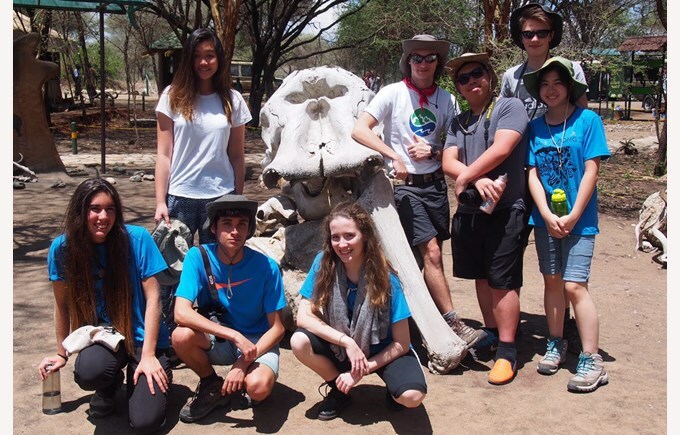 Seventeen Year 12 students and two staff spent Chinese New Year in Tanzania as part of the Nord Anglia Global Campus expedition programme. 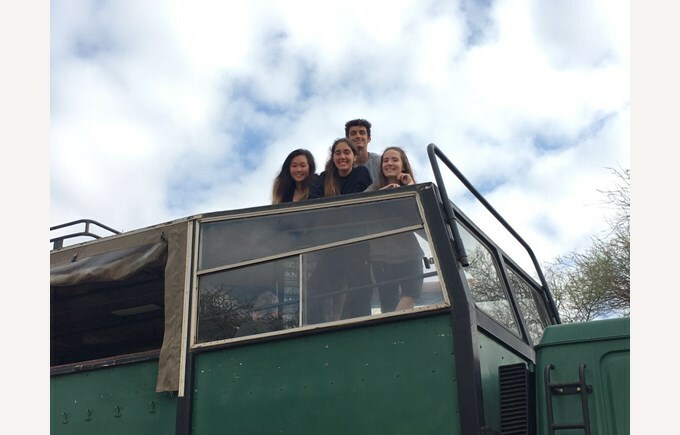 Expeditions have been running steadily since October last year with hundreds of students and staff from Nord Anglia schools staying at Shamba Kipara Camp near Arusha in northern Tanzania. This year we were delighted to find that we were living and working with students from our NAIS sister schools in Washington and Warsaw, offering the chance to make new friendships within the Nord Anglia family. It was a real pleasure to see the strength of the friendships made but sad to watch the tears at the end of the trip! 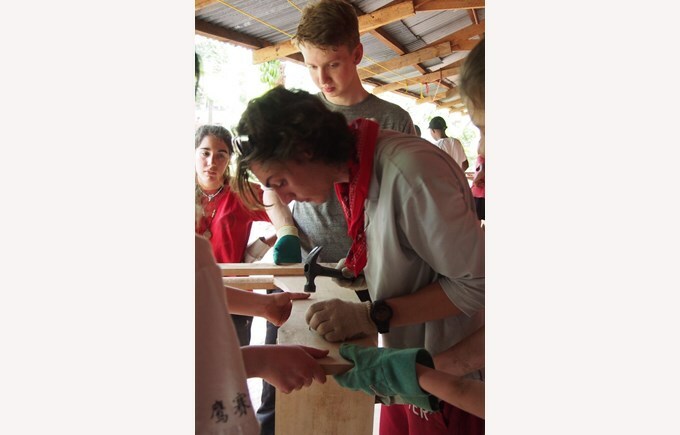 Students have been able to learn about the lives of people in this area through direct contact working alongside members of the community and have been involved in development projects working alongside a local NGO who have been working in this area for more than ten years and Nord Anglia has worked with them to identify sustainable, manageable projects in which our students can take part. 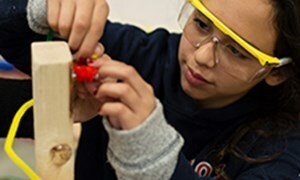 Over the last two years, projects have been divided into a community-based and a school-based phase. The school project was based at a single primary school close to our base. The school has only limited resources and, at the start of the current school year, no housing for teachers, a lack of classrooms and limited desks for students. For the teachers who work there, it means a long journey to work: several miles walk each day. 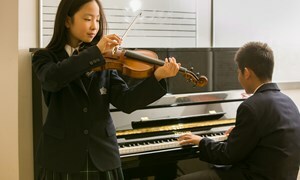 This reduces their time for extra lessons and for sports and the other CCA activities that we take for granted here in Pudong. Limited classrooms and desks mean that class sizes are big and students are often squeezed four or five to a single basic desk. 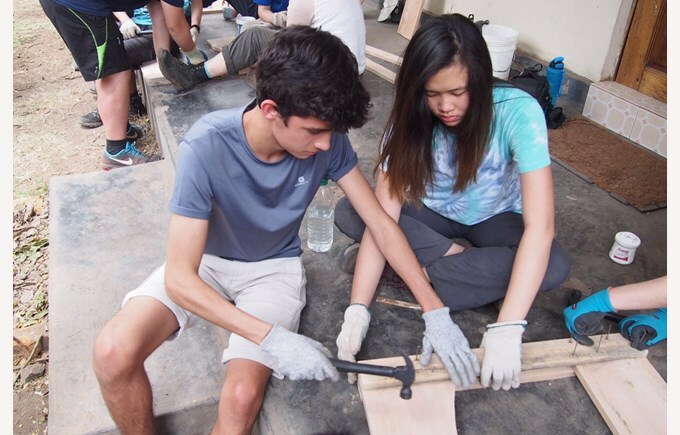 NAIS students worked colossally hard over two days on the physically challenging work of building a classroom block. Our job was to lay the foundations which meant mixing large quantities of concrete using heavy loads of sand, water, gravel and cement. This happened in an exposed area with little shade, strong sunshine and temperatures which reached the mid-40s! Our students deserve huge credit for their commitment to the project as well as to looking after each other in what were sometimes challenging conditions. Both of our teams broke records for the amount of work done. In the morning, we were brought to the school. The school was very small to be a government primary school, it had 4 or 5 classrooms that the students used, with only basic desks and chairs to use for studying. 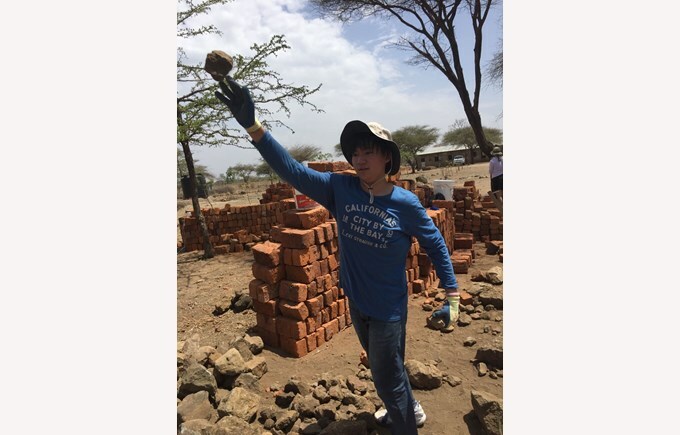 As a group, we made cement for the foundations and collected rocks for the foundations of the new primary building we were building. We were mostly mixing cement. We learned how to make cement using 5 wheelbarrows of sand, 1 bag of cement and 4 wheelbarrows of gravel. It was hard work just mixing the cement together due to the gravel and the sand. We also learned that as a group many things can be accomplished, even smashing the record on how much concrete a group could mix in a day! As an individual, I learned that with a clear mind and a happy attitude, you can accomplish anything. Even if you are physically tired, you need to be mentally strong and keep persevering, do not slack off! It made me realized that we cannot take things for granted and need to watch what we do as humans because once you have seen the kids, it is an eye-opener to me. Bright smiles and waving hands brought an eager grin to our faces, followed by the motivation to make a change for the people who were in need around the area. At the very beginning of our service work, we visited the area which was the focus of both the school and community projects last year. This was an area which was quite deserted - both landscape wise and population wise. Houses were dispersed, and the few adults we walked past were all so welcoming. Bright smiles and waving hands brought an eager grin to our faces, followed by the motivation to make a change for the people who were in need around the area. Walking around for an hour or so, we got to see the finished products of the Tanzania project from last year. We learned that the purpose of the new houses was for the teachers to stay near the school, rather than having to travel dangerously every morning and evening, with risks of coming to school late, which would penalise the students. Not only did it inspire us to do a job as good as that one, but the ecstatic kids gave us want to help them. After walking around the area, we headed to Seeway, this time 20 minutes away from where we were originally. The orphanage and school here are run by two women who first visited Tanzania for 6 days, and ended up staying for 14 years, in order to help primary students learn well, so they could pass the entrance exam for secondary - an exam many kids fail to pass. The buildings were much more colourful, we could see the area was much more taken care of than the previous one. We had lunch here and then headed back to make a start on our community project work. Our community project focused on three key things all of which aimed to improve the quality of life for the families with which we worked. These were the building of a goat shed and giving the gift of a young female goat; installing a small solar panel and simple indoor lighting along with a single socket in each house and lastly building, from mud bricks and “cement” made from cow dung, ash, dust and water, a simple fuel-efficient stove. The goat shed provides safe nighttime refuge for the goat from wild animals rather than being brought into the family home each evening; the goat itself offers a source of food and income from milk, breeding and meat. The solar lighting allows families to reduce their dependence on expensive and health-threatening kerosene lighting; solar lights indoors allow children the chance to study after dark. The stove reduces the need for fuelwood, therefore, reducing local deforestation and soil erosion as well as reducing smoke indoors which can have a devastating impact on family health, particularly in the young and old. Two of us were asked to install solar panels for a grandma, the same grandma we were building a shed for. Building goat sheds were actually more difficult than we thought! The sun was scorching, sweat was dripping from our foreheads, but not once did our want to slip away from our work. It asked for a lot of effort; hammering nails in hardwood was by far the most difficult task. Why? The nails kept bending, the wood would break, and it even took us four times before successfully getting a nail in! Though we had to leave our work unfinished on the first evening, the following day, we came back refreshed. Our motivation was just as present. As some were working on the goat shed, two of us were picked out to make a stove for the families. My partner and I were surprised to see how effectively we could work together and how nice it felt, to know we could help a family in need. The woman who was in charge of the food in the household paid attention to our work, and to our surprise, she got involved in strengthening the stove, and initiated a couple of ideas in order to make it better! Soon after, we finished the goat shed (and even brought them a goat! ), and all took a picture with the family we helped. As we headed back to Seeway, we once again ate lunch, and then assembled a school desk. The task asked for a lot of precision, and care, and our finished product was looking strong and beautiful. My partner and I were surprised to see how effectively we could work together and how nice it felt, to know we could help a family in need. 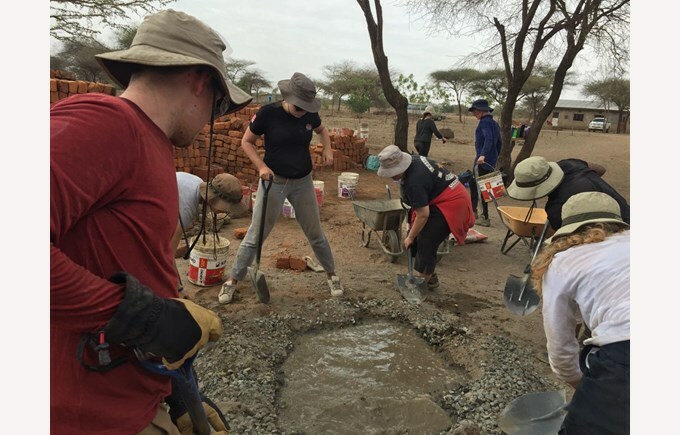 Overall, the community work we've done in Tanzania was enjoyable, as we all felt pleased that we made a change in people's lives, and brought them help. With no doubt, would we all return to help them even more! 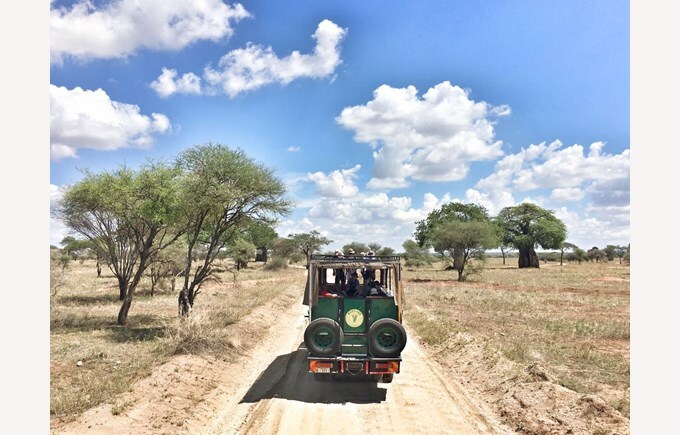 The third aspect of our trip was safari! 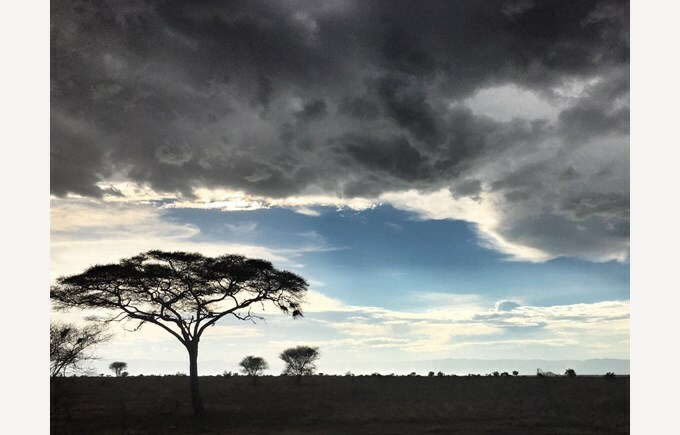 We were lucky enough to see amazing animals like the elephants, giraffe, zebra, baboons, “Pumba”, lions, birds and many more. In the end, the main part of the two days was seeing the animals. By going to the park and paying our admission and guides wages, this aspect of the trip also allowed us to see and learn more of Masaai culture and to consider how tourists paying for safari experiences can contribute to the protection of these animals. Our work also sparked quite a few important questions, questions about the world and society in which we live. “Why is such a situation being created in the first place that leads to underfunding of education when governments have so much money?”, “Why was the local landowner refusing to give water to the school for building to make the village better?”, “What issues forced him to go to measures such as cutting water to the village for months at a time?”, and “How was such a situation created in the first place and how can it be mitigated?”. While none of these questions have easy answers, we can only hope that our work can add pieces to the puzzle. By creating classrooms instead of simply donating toys or clothes, we addressed a real need, and one in a way to avoid putting local businesses out of competition which makes the problem worse. Another big question that popped up, which is especially important to global society and the efforts of those willing to help the community. Just what is sustainable development? How do we define it? I think the answer comes from the individual efforts. We learned, through our work, how our work was sustainable. By employing the funds, we created guaranteed employment for the community. By using rocks instead of large amounts of cement, we promoted environmental sustainability. By creating classrooms instead of simply donating toys or clothes, we addressed a real need, and one in a way to avoid putting local businesses out of competition which makes the problem worse. Allowing the local community to educate itself also allows them to be free of any dependencies so that they can focus on helping others by extension and multiplying our efforts. 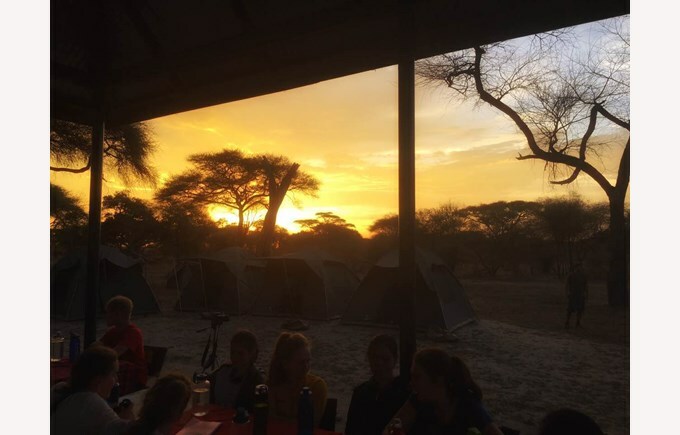 Staff and students now focus on sharing our experiences and the things that we have learned during our time in Tanzania and in planning next year’s expeditions for students in Year 11. 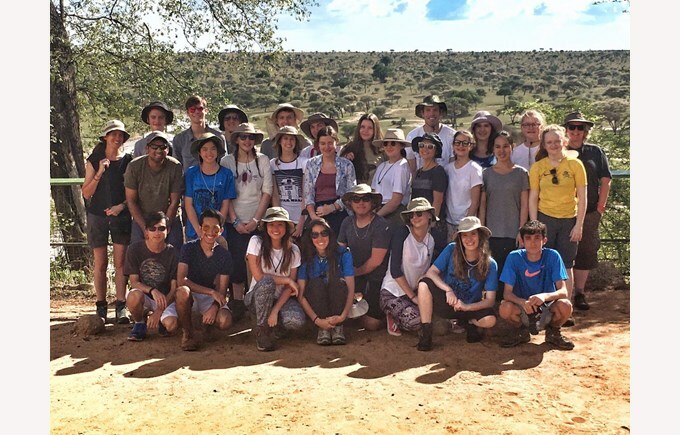 This trip was a huge learning experience for our students and aimed to challenge them as thinkers, global citizens, and IB students as much as simply involving them in development projects and a safari experience. 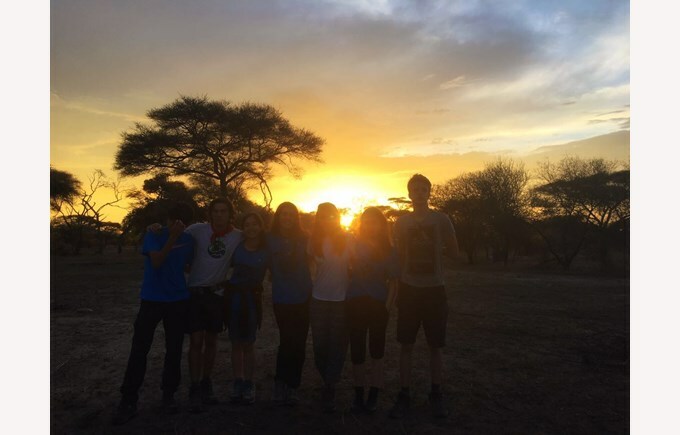 Each evening was spent reflecting on the day’s activities and considering the effects of our actions in terms of sustainable development from an environmental as well as a social perspective. We researched the Sustainable Development Goals and examined how our actions contributed to their achievement. 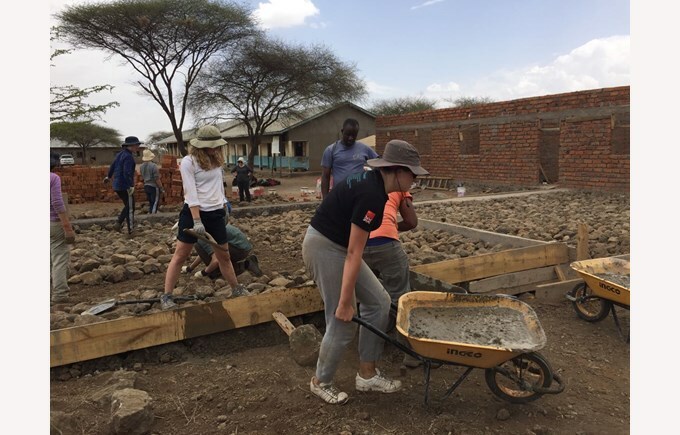 We also thought hard about difficult questions about our own roles: how we would be perceived by local Tanzanian people, the rights and wrongs of taking photos of children watching us work, of visiting classrooms, of touring villages. 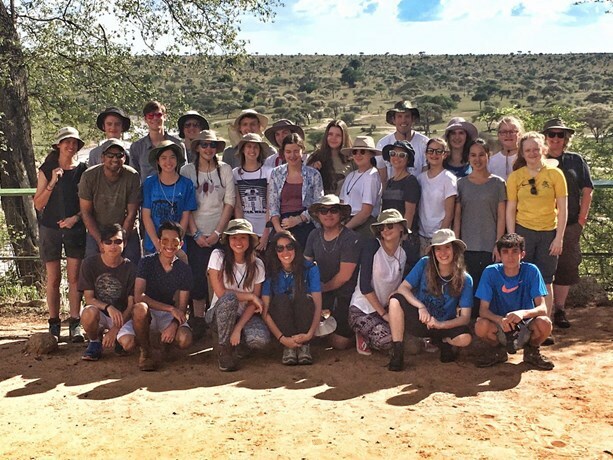 Speaking as one of the staff on the trip, I can say with confidence that I have rarely been as proud of the achievements of a group of students. 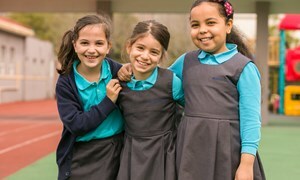 Our team quickly made firm friends with fellow Nord Anglia students and worked passionately together in strong, effective teams; as staff, we often commented on how it was difficult to identify which students came from each school as they bonded so effectively. 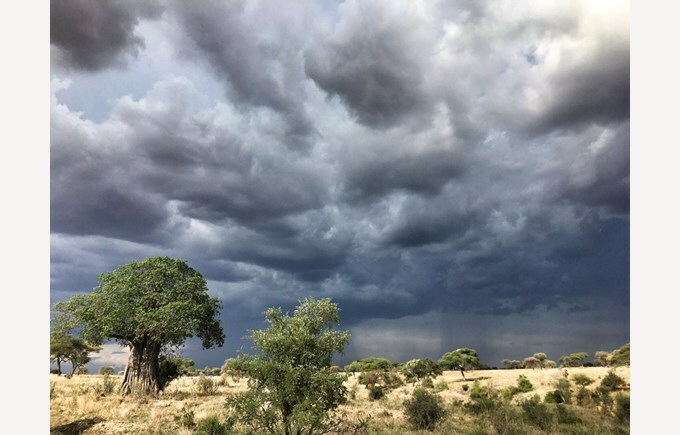 They worked in often challenging physical and emotional conditions: under the blistering sun and torrential rain and never let it slow them down or dampen their spirits. 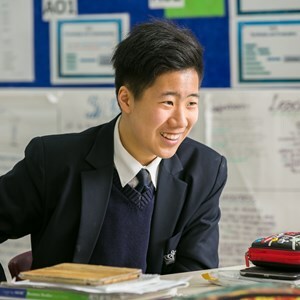 Our students were humble as well as passionate, caring and determined to do the best they possibly could and the quality of their discussions, questions and comments was outstanding.